My siblings and I grew up on Puget Sound, on Filucy Bay. These are for their next Christmas gifts. I know these pillows will pull a few heart strings. This was a Christmas present for my Dad. A great idea for anyone has a favorite spot. It was very easy to order & before it was printed I was sent a mock up and was allowed to adjust the printing. The pillow was a gift for my son and his first child. Their new baby was named after their favorite park in Arkansas. They were blown away by the pillow. It was such a unique one of a kind present and it will be a treasured possession. The pillow came out just as I had specified. It is beautifully made, and the recipient loved it. I would order from this company again, for sure. 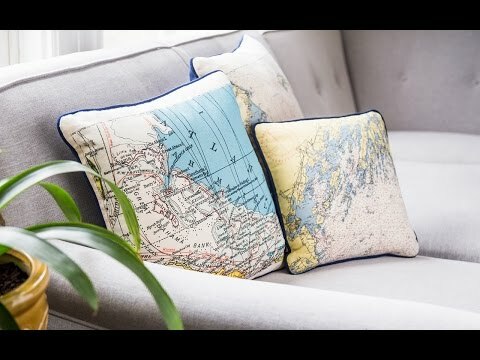 The San Diego Bay pillow was a big hit with my San Diego bride, and recalled for us my three years of active service on a San Diego based USN destroyer during the Vietnam years! 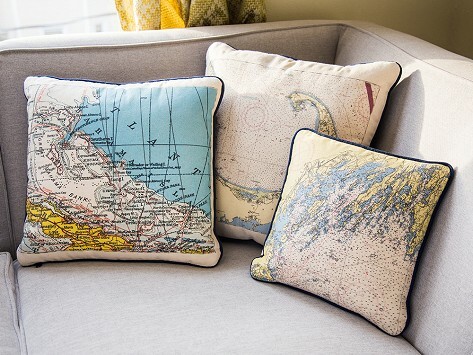 This nautical pillow was a gift for my hard-to-shop-for husband and he loved it! It features a place on the coast dear to our family. What a special, unique gift. The material was a quality, durable fabric, very well-made. Took the time to get it right, beautiful! The team corresponded with me several times to get the pillow exactly as I wanted it. They ere were really quick to respond and once we decided on a layout it came very fast. I would definitely recommend this product and doing business with The Grommet! The quality seems really nice and should be a perfect gift for someone who just moved to have a daily reminder of where they used to live. Very happy with my purchase and the resulting outcome, was a very quick and easy process as well and was delivered well ahead of the initial estimate.